I am selling a 2007 257CC Seafox. 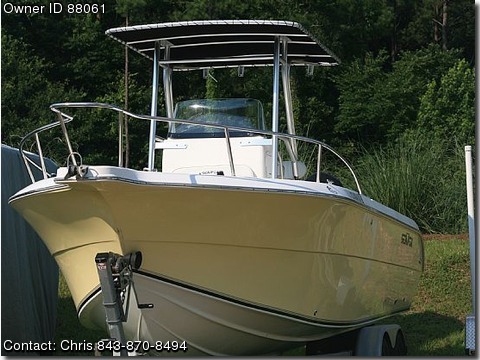 Boat is a fighting lady yellow and comes with a 250 4 stroke suzuki. Boat comes with a tandem wheel trailer. Boat comes with a coast guard safety package, compass, cd-player with 4 speakers, t-top, 2 coolers, vhf radio, and a leaning post. There is also a head in the center console for the ladies or young kids. Really comes in handy when there is alot of boat traffic for the kids. I am selling the boat or you can take over payments. Just added a brand new lowrance HD5S.